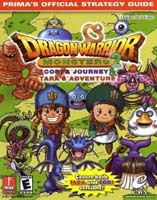 DRAGON WARRIOR MONSTERS 2: COBI’S JOURNEY & TARA’S ADVENTURE--PRIMA’S OFFICIAL STRATEGY GUIDE welcomes you back to the fun of training and breeding fabulous Dragon Warrior Monsters! This guide covers both COBI’S JOURNEY and TARA’S ADVENTURE--two distinct games with terrific linking capabilities. This guide will give you stats and info about all the monsters, locations to collect Magic Keys, a complete walkthrough with maps of all areas in both games, and essential info on linking up the two games for the ultimate DRAGON WARRIOR MONSTERS experience!